“How constantly, in the Scriptures, do we encounter such words as ‘field,’ ‘seed,’ ‘sower,’ ‘reaper,’ ‘seed-time,’ ‘harvest’! Employing such metaphors interprets a fact of nature by a parable of grace. The field is the world and the good seed is the Word of God .Whether the Word be spoken or written, it is the power of God unto salvation. In our work of evangelism, the whole world is our field, every creature the object of effort and every book and tract, a seed of God.” — DAVID FANT, JR.
GOD’S Word is a record of prayer — of praying men and their achievements, of the Divine warrant of prayer and of the encouragement given to those who pray. No one can read the instances, commands, examples, multiform statements which concern themselves with prayer, without realizing that the cause of God, and the success of His work in this world is committed to prayer; that praying men have been God’s vicegerents on earth; that prayerless men have never been used of Him. A reverence for God’s holy Name is closely related to a high regard for His Word. This hallowing of God’s Name; the ability to do His will on earth, as it is done in heaven; the establishment and glory of God’s kingdom, are as much involved in prayer, as when Jesus taught men the Universal Prayer. That “men ought always to pray and not to faint,” is as fundamental to God’s cause, today, as when Jesus Christ enshrined that great truth in the immortal settings of the Parable of the Importunate Widow. As God’s house is called “the house of prayer,” because prayer is the most important of its holy offices; so by the same token, the Bible may be called the Book of Prayer. Prayer is the great theme and content of its message to mankind. The Word of God is the fulcrum upon which the lever of prayer is placed, and by which things are mightily moved. God has committed Himself, His purpose and His promise to prayer. His Word becomes the basis, the inspiration of our praying, and there are circumstances under which, by importunate prayer, we may obtain an addition, or an enlargement of His promises. It is said of the old saints that they, “through faith obtained promises.” There would seem to be in prayer the capacity for going even beyond the Word, of getting even beyond His promise, into the very presence of God, Himself. Jacob wrestled, not so much with a promise, as with the Promiser. We must take hold of the Promiser, lest the promise prove nugatory. Prayer may well be defined as that force which vitalizes and energizes the Word of God, by taking hold of God, Himself. By taking hold of the Promiser, prayer reissues, and makes personal the promise. “There is none that stirreth up himself to take hold of Me,” is God’s sad lament. “Let him take hold of My strength, that he may make peace with Me,” is God’s recipe for prayer. By Scriptural warrant, prayer may be divided into the petition of faith and that of submission. The prayer of faith is based on the written Word, for “faith cometh by hearing, and hearing by the Word of God.” It receives its answer, inevitably — the very thing for which it prays. The prayer of submission is without a definite word of promise, so to speak, but takes hold of God with a lowly and contrite spirit, and asks and pleads with Him, for that which the soul desires. Abraham had no definite promise that God would spare Sodom. Moses had no definite promise that God would spare Israel; on the contrary, there was the declaration of His wrath, and of His purpose to destroy. But the devoted leader gained his plea with God, when he interceded for the Israelites with incessant prayers and many tears. Daniel had no definite promise that God would reveal to him the meaning of the king’s dream, but he prayed specifically, and God answered definitely. The Word of God is made effectual and operative, by the process and practice of prayer. The Word of the Lord came to Elijah, “Go show thyself to Ahab, and I will send rain on the earth.” Elijah showed himself to Ahab; but the answer to his prayer did not come, until he had pressed his fiery prayer upon the Lord seven times. Unless the vital forces of prayer are supplied by God’s Word, prayer, though earnest, even vociferous, in its urgency, is, in reality, flabby, and vapid, and void. The absence of vital force in praying, can be traced to the absence of a constant supply of God’s Word, to repair the waste, and renew the life. He who would learn to pray well, must first study God’s Word, and store it in his memory and thought. The utmost reach and full benefit of the rich promises of the Word of God, should humbly be received by us, and put to the test. The world will never receive the full benefits of the Gospel until this be done. Neither Christian experience nor Christian living will be what they ought to be till these Divine promises have been fully tested by those who pray. By prayer, we bring these promises of God’s holy will into the realm of the actual and the real. Prayer is the philosopher’s stone which transmutes them into gold. If it be asked, what is to be done in order to render God’s promises real, the answer is, that we must pray, until the words of the promise are clothed upon with the rich raiment of fulfilment. How comprehensive, how far reaching, how all-embracing! How much is here, for the glory of God, how much for the good of man! How much for the manifestation of Christ’s enthroned power, how much for the reward of abundant faith! And how great and gracious are the results which can be made to accrue from the exercise of commensurate, believing prayer! Prayer, coupled with loving obedience, is the way to put God to the test, and to make prayer answer all ends and all things. Prayer, joined to the Word of God, hallows and makes sacred all God’s gifts. Prayer is not simply to get things from God, but to make those things holy, which already have been received from Him. It is not merely to get a blessing, but also to be able to give a blessing. Prayer makes common things holy and secular things, sacred. It receives things from God with thanksgiving and hallows them with thankful hearts, and devoted service. That is a statement which gives a negative to mere asceticism. God’s good gifts are to be holy, not only by God’s creative power, but, also, because they are made holy to us by prayer. We receive them, appropriate them and sanctify them by prayer. To know God’s will in prayer, we must be filled with God’s Spirit, who maketh intercession for the saints, and in the saints, according to the will of God. To be filled with God’s Spirit, to be filled with God’s Word, is to know God’s will. It is to be put in such a frame of mind, to be found in such a state of heart, as will enable us to read and interpret aright the purposes of the Infinite. Such filling of the heart, with the Word and the Spirit, gives us an insight into the will of the Father, and enables us to rightly discern His will, and puts within us, a disposition of mind and heart to make it the guide and compass of our lives. Epaphras prayed that the Colossians might stand “perfect and complete in all the will of God.” This is proof positive that, not only may we know the will of God, but that we may know all the will of God. And not only may we know all the will of God, but we may do all the will of God. We may, moreover, do all the will of God, not occasionally, or by a mere impulse, but with a settled habit of conduct. Still further, it shows us that we may not only do the will of God externally, but from the heart, doing it cheerfully, without reluctance, or secret disinclination, or any drawing or holding back from the intimate presence of the Lord. Some years ago a man was travelling in the wilds of Kentucky. He had with him a large sum of money and was well armed. He put up at a log-house one night, but was much concerned with the rough appearance of the men who came and went from this abode. He retired early but not to sleep. At midnight he heard the dogs barking furiously and the sound of someone entering the cabin. Peering through a chink in the boards of his room, he saw a stranger with a gun in his hand. Another man sat before the fire. The traveller concluded they were planning to rob him, and prepared to defend himself and his property. Presently the newcomer took down a copy of the Bible, read a chapter aloud, and then knelt down and prayed. The traveller dismissed his fears, put his revolver away and lay down, to sleep peacefully until morning light. And all because a Bible was in the cabin, and its owner a man of prayer.” — REV. F. F. SHOUP. Prayer opens the way for the Word of God to run without let or hindrance, and creates the atmosphere which is favourable to the word accomplishing its purpose. Prayer puts wheels under God’s Word, and gives wings to the angel of the Lord “having the everlasting Gospel to preach unto them that dwell on the earth, and to every nation, and kindred, and tongue, and people.” Prayer greatly helps the Word of the Lord. 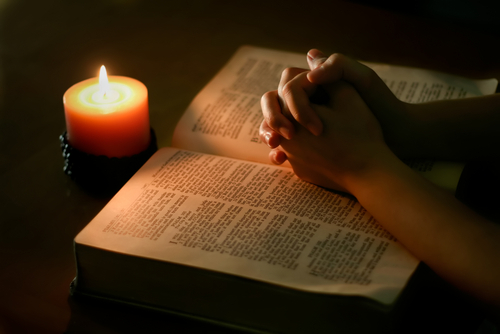 Prayer invariably begets a love for the Word of God, and sets people to the reading of it. Prayer leads people to obey the Word of God, and puts into the heart which obeys a joy unspeakable. Praying people and Bible-reading people are the same sort of folk. The God of the Bible and the God of prayer are one. God speaks to man in the Bible; man speaks to God in prayer. One reads the Bible to discover God’s will; he prays in order that he may receive power to do that will. Bible-reading and praying are the distinguishing traits of those who strive to know and please God. And just as prayer begets a love for the Scriptures, and sets people to reading the Bible, so, also, does prayer cause men and women to visit the house of God, to hear the Scriptures expounded. Church-going is closely connected with the Bible, not so much because the Bible cautions us against “forsaking the assembling of ourselves together as the manner of some is,” but because in God’s house, God’s chosen minister declares His Word to dying men, explains the Scriptures, and enforces their teachings upon his hearers. And prayer germinates a resolve, in those who practise it, not to forsake the house of God. This entry was posted in Bible Teachings, Inspirational Messages and tagged EM Bounds, em bounds on prayer, faithfulness of prayer, importance of prayer, prayer, prayer and the promises, prayer and the word of GOd, prayer in the bible, praying the word. Bookmark the permalink. Greetings to you in the precious and merciful name of our Savior Lord Jesus Christ.I humbly request you to allow to introducing my self.I Rev.P.C.Bantu praising my God for choosing me and my Co-Workers to proclaim the love and the Gospel of Jesus Christ in our parts of India”Woe is unto me,if I preach not the Gospel” 1.Cor.9:16.We have small Ministry the name of Ministry is ZION FELLOWSHIP MINISTRY,please pray for our Ministry. We reaching the gospel to unreached groups we thanks God that many perishing souls have come to the saving knowledge of Jesus Christ through our Ministry We reaching the gospel to different Villages,Towns,Slums and tribal areas.Still there are thousands of Villages without Gospel and Millions of People yet to hear the Good New of Jesus as people worship idols,nature animal,snake,cows and trees for this we need your prayers and co-operation to go forward in our Lord’s Great Commision to Reach and Win many lost souls for the extension of His Kingdom. We ask you in Christ to Join Hands with us to pray fervently for great Revival and for soul wining of India. Presently we working in State of Orissa,there is great persecution going on against of Christian People,Past year thousands of Christian people they stayed in relief camp and hundreds of families they left their houses and went different Cities to stay there because of fear.Many believers,Evangelists and Pastors they sacrificed their lives for God’s work. Our Pastors and Evangelists they going Village to Village and proclaiming the Gospel to unreached people even we are getting persecution yet we are not forsaking to proclaiming the Gospel,through gospel of Jesus somany people are saved coming to Church so kindly consider our part of Orissa Ministry on your Prayer.We requests to you kindly come and Visit our Orissa Ministry,We have small small shade type Churches where we doing Sunday Services and also we doing Sunday Services at homes.We working among Hindus and we doing Sunday Services at Hindu Villages. Our Pastors and Evangelists need helps for gospel work and also they need Bicycle for gospel work to go Village to Village to proclaim the gospel so kindly pray for them and also pray for our poor Children and widows those are suffering for physically no one looking for them.ZION FELLOWSHIP WORKING AMONG HINDUS TO WIN LOST SOULS FOR JESUS. YOUR SUPPORT WILL SAVE SOME LOST SOULS OF INDIA SO KINDLY PRAY AND VISIT OUR ZION FELLOWSHIP AND SEND YOUR PRECIOUS SEED FOR GOSPEL WORK OF ZION FELLOWSHIP.